Buy a home with land and you’ll probably have an olive tree or two on it. They’re not only beautiful and shady, but nothing tastes better than your first virgin olive oil. I well remember my first harvest. There are several ways to harvest olives. Some are more labour intensive than others, but it is rarely worth paying someone to pick them for you. For both maximum quality (and profit), timing is vital as there can be a big difference in the grading of the oil and the price you can achieve when you come to sell them at the local olive press. If you don’t want to pick them yourself it is best to do a deal with a local farm worker who has picking equipment, and will take the olives and give you a percentage of the oil. This is what we did last year. He came with four men, equipped with special rakes on poles that shake as they rake. He also had a piece of machinery that hoovered up the olives from the rolled ground and another that sorted them from the leaves and stones, before dropping them into the truck. It was all done very quickly. In the years we have picked the olives ourselves it has taken us a lot longer. We don’t take olive farming too seriously, but it is nice to have enough olive oil for our own use and whatever we sell is a bonus. It usually costs us about €11 per 100kg (1 quintale) of olives to be pressed. We have found we roughly need to take about 300-400kg of olives for them to fill our 50 litre churn with oil. After a very dry summer, not all of our trees have produced olives this autumn. This has been the case across Italy, with reports of a decrease of 11% compared to average production over the past decade. But those trees that have produced are of very high quality and the press is paying good money for them. As we have both large old trees and rows of medium size ones we are collecting the olives in two ways. Firstly, the old trees are so large that you would need a giant to pick the top branches and they are too solid for one of those tree-shaking machines. 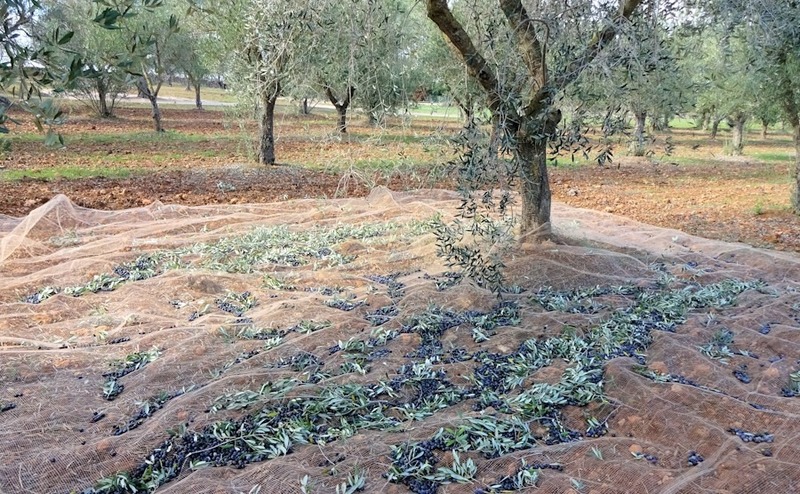 So, nets have been put under them weighted down by big stones, so that on a windy day the olives will just drop on the nets when they are ready. Some local farmers don’t even put down nets. Instead they roll the ground flat round the tree and use what looks like a witch’s broom to sweep them up. 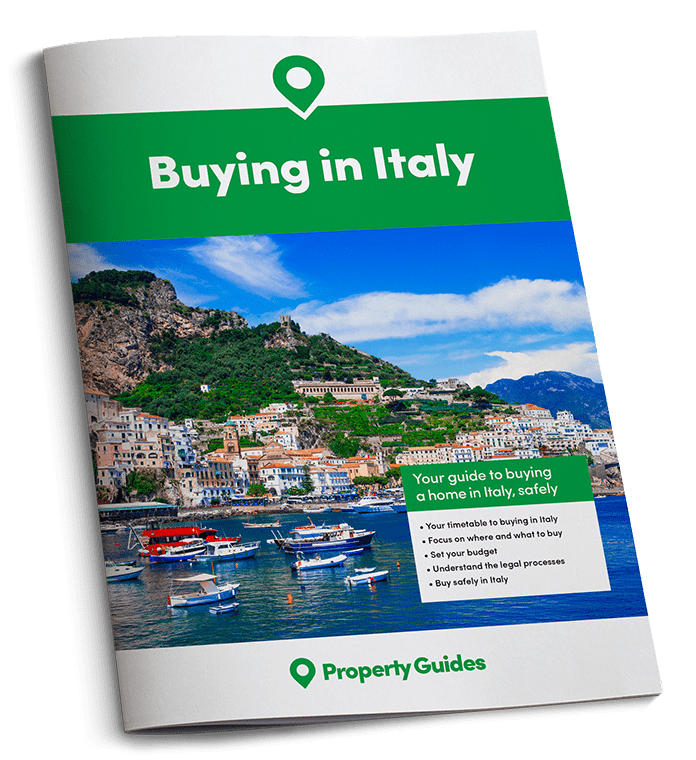 If you’re looking for a house with land, head over to our Italian property listings. When we have time to lift the nets we will also rake some out of the tree from the branches we can reach. We’ll then just lift one end of the net and tip the olives to the other end, before pouring them into a large plastic bin. (Some people use crates). 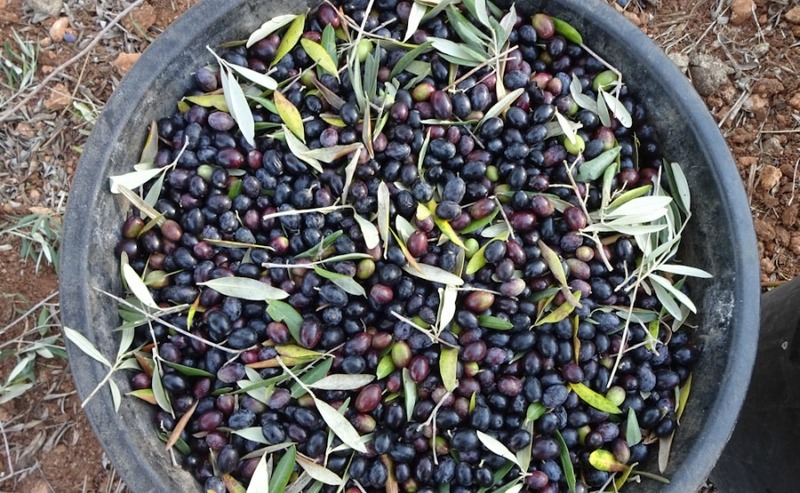 The olives that have spent time on the net won’t produce such a good quality oil or earn as much money from the press, but it makes good enough oil for cooking. The smaller trees were pruned two years ago and many of them are packed with olives, especially those nearest to the river. These are the ones we hand pick. We just put a net either side of one tree, big enough to cover the drop area. Then using a small hand rake designed to mimic fingers, we comb the soft branches and the olives drop off easily. For higher branches we have a hand rake taped to a long wooden broom handle and another one on an extendable paint roller pole. These olives we left to collect themselves! In one day of picking from 7am until 2.30pm, the fitter of the two of us filled seven bins with olives, which weighed over 200kg at the press. 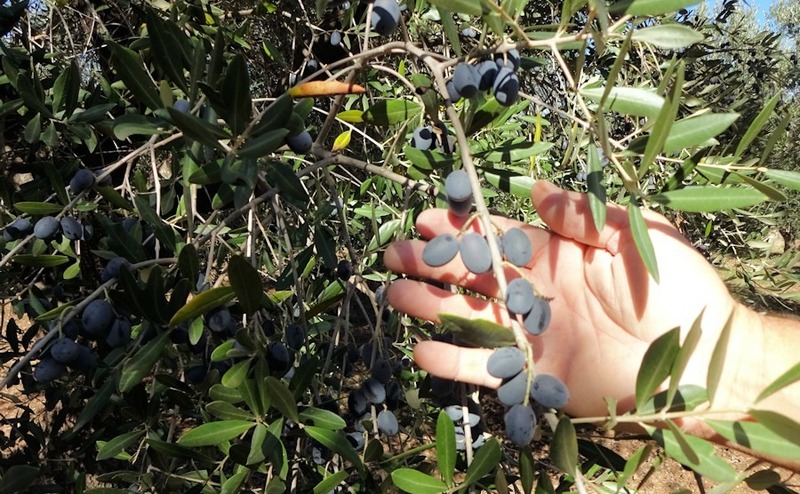 As they were quality olives, hand-picked that day, the press offered us €50 per 100 kg. They were sure to make good extra virgin olive oil with an expected free acidity level of 0.2%. If you’re looking for an Italian home with land, knowing how to negotiate effectively may get you a few more olive trees for your money. Read our guide: How to Negotiate Abroad. As defined by the European Commission the highest quality olive oil (Extra-Virgin olive oil) must feature a free acidity lower than 0.8%. Virgin olive oil is characterized by acidity between 0.8% and 2%. The press we use also uses a cold extraction system which means that no heat is added during extraction, as required by the EU. Oil from outside the EU doesn’t have these restrictions and so heated water may increase their yields but lowers the quality of the oil. The region of Apulia produces the most oil in Italy. If you buy a country home here, whether it’s a cone shaped Trulli , a villa or a Masseria, there is a good chance it will come with some olive trees. Take a look through what’s on offer in Apulia on Rightmove. There are some great properties at really low prices right now.